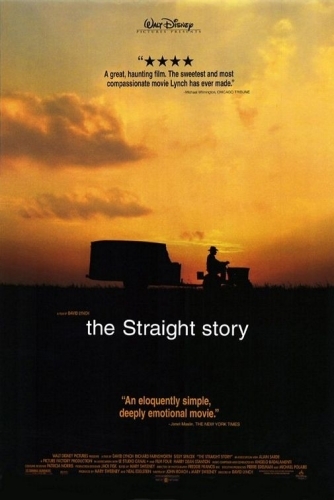 The Straight Story is quite simply a beautiful, nigh on perfect little movie. It may lack Lynch’s trade mark surrealist tropes and convoluted narrative structures. But it could be argued that this is far and away his finest hour. Alvin Straight is old. His hips are shot and his eyesight is failing. But his tongue is as sharp as his mind. Upon hearing that his estranged brother has suffered a stroke, Alvin decides to bury the hatchet and visit his brother, who lives several hundred miles away. Although his failing eyesight prevents him from driving, Alvin is determined to make this journey by himself. So he decides to use his ride on lawn mower as an unconventional means of transport. And thus begins a gentle, touching, road movie. David Lynch is not everyone’s cup of tea. He is a uniquely talented director whom can be viewed as either overly self indulgent or creatively brilliant, depending on which side of the white picket fence you find yourself. Leave your trepidation at the door, because The Straight Story is quite brilliant. It is also very straight. A stroke of cheeky genius from Lynch (at once referencing Lynch’s penchant for convoluted narratives, describing accurately the movie itself whilst at the same time reassuring the hesitant viewer) the title couldn’t be more perfect. And perfect is the best way to describe this little gem of a movie. Gone are the caricatures and grotesque characters that populate many of Lynch’s usual output. The characters of The Straight Story are exactly that. Straight, normal every day folks. Richard Farnsworth is centre stage as Alvin Straight, The somewhat cantankerous, straight talking old man. Determined, through pride and a sense of deeply felt penance, to make the journey to see his brother alone. It is a remarkable performance, full of pride, dignity, sadness, melancholy and bloody minded determination all writ large in Farnsworth steely grey eyes. Every line on his face is a line from his life story. Farnsworth started out as a cowboy, before becoming a highly respected stuntman and eventually an extremely gifted character actor. Farnsworth lived a full, roller coaster life and he brings that experience to his performance as Alvin. Farnsworth is almost never off screen, and it is a pleasure to spend the running time with this sincere, charming, and stoic gentleman. Farnsworth is beautifully supported by Sissy Spacek, in a heartbreakingly poignant role as Alvin’s daughter Rose. It is a subtle, nuanced performance that steels every scene Spacek is in. No mean feet considering her screen partner is Farnsworth himself. All the other characters, no matter how fleeting or small, feel like real people. Men and women you find all over small town America. The types usually de-constructed so darkly by Lynch, here they are a pleasure to meet. Tears will be shed more than once viewing The Straight Story. Unless you’re a cyborg with its processor set to read only. The revelation that Rose had her children taken away from her is heartbreaking. When Calvin discusses being old with a group of young cyclists he encounters, or when he confesses to a fellow veteran that he accidentally killed one of his own men during the war, tears will flow freely. As they will when Alvin finally comes face to face with his brother. (The wonderfully scruffy Harry Dean Stanton) There’s no big pay off. No swollen score. Just two staunchly proud old men silently forgiving each other as they sit on the porch together. The pace is serene, though never plodding. It unfolds exactly as it should. The script is sparse to say the least, most of the dialogue takes place in the opening scenes. This works beautifully as Lynch lets the images do the talking. A thousand words are replaced by a single glance from Farnsworth, A slight shift in expression on Spacek’s face says more than any script writer could wish to convey. As Alvin makes his way across the Midwest Lynch showcases the beauty and sheer majesty of the American Landscape. Beautifully photographed by the truly gifted Freddie Frances, it is a visual feast. The Straight Story also showcases Lynch’s innate talent as a director, showing he is not a one trick pony bound to the bizarre and disturbing. It’s great to see him working outside his wheelhouse and I for one hope he does this more. The visuals are perfectly complimented by the score. A beautiful, simple blue-grass country riff that doesn’t outstay its welcome and lends itself nicely to the vistas on display as Alvin makes his journey. The Straight Story is a perfect little movie. It’s poignant and moving without being mawkish or cloying, and visually it is a real treat. Criminally overlooked at awards ceremonies, Richard Farnsworth brings the movie to life with a beautifully realised performance. Can’t recommend it enough.